A quick review: The “skills gap” explanation for slower employment growth this recovery posits that there are large numbers of jobs waiting to be filled but hiring is sub-par after the recession because of a lack of qualified candidates to fill those positions. Twice I have presented some evidence on the issue, here and here. Most of the concern and evidence about the existence of a skills gap addresses very high-skill technical, scientific, computer, and engineering occupations because our nation, and by extension our state, seem to perpetually be unable to produce enough individuals in those fields to satisfy industry demand. As a result we “import” a lot of that talent from foreign countries (more about this – I promise – in a future post). There is some evidence of this in NH. As the chart below shows, professional, scientific, and technology occupations are the largest, broad category of help wanted ads in the state. But they have also evidenced the smallest increase (a decrease actually) since the recession. There is still a significant demand but it may be that an inability to find qualified applicants has companies in need of those occupations from considering more hiring in the Granite State. A quick review of data for Massachusetts shows that demand for professional, scientific and technical occupations has increased during the same time period. But more direct evidence of a skills gap comes from the demand for construction and production workers. I am especially interested in the potential skills gap for production workers. The chart above shows that demand for construction, production, and transportation workers has increased significantly since the recession. 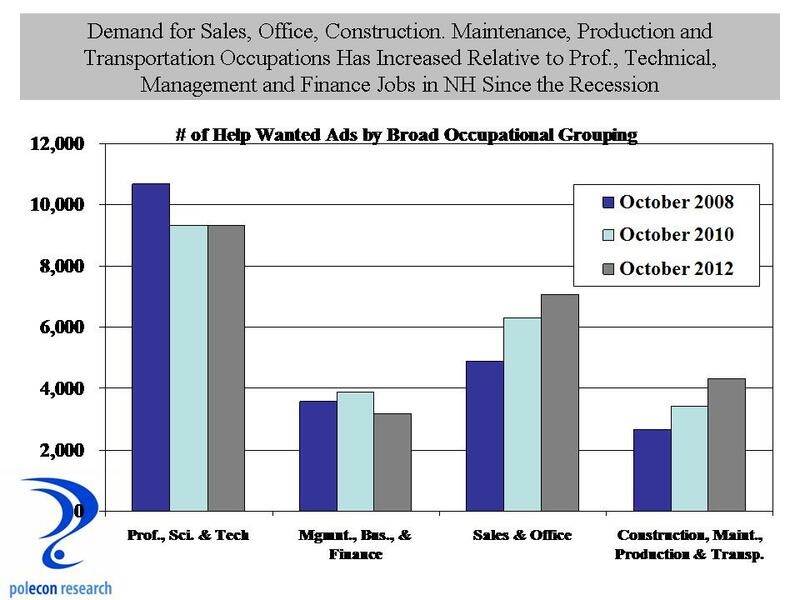 Although still a much smaller category of help-wanted ads than professional and technical jobs, the increased demand is consistent with anecdotal evidence I heard this week at a roundtable discussion of the Seacoast economy. At that discussion, representatives from industry, higher education, and economic development organizations cited specific examples of companies frustrated at their ability to hire skilled production workers. Some are forming partnerships with NH’s community college system to increase the supply of needed occupations. Those initiatives show promise and I hope the state’s four-year colleges and universities develop more partnerships to address the skills gap in professional, scientific and technical occupations as well because, increasingly, job growth in NH appears to depend on it. This entry was posted on November 21, 2012 at 12:19 pm and is filed under Help Wanted, job growth, NH Economy, Skills Gap. You can subscribe via RSS 2.0 feed to this post's comments.